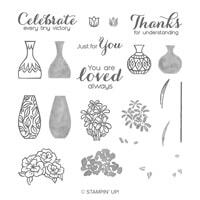 It’s Thursday, so I am back with another “throw back” post re-sharing many ideas with the Varied Vases stamp set. I have not touched this set in awhile, but digging out these old pictures makes me want to play with it again. If you are new to stamping, or new to following me, these ideas will be NEW TO YOU so I hope you enjoy them and they inspire you. Love this card…..love the colors! If you’d like the details on this card, CLICK HERE to go to the original post. Another fun card!!! This one uses the 2018-2020 In-Colors! CLICK HERE to go to the original post. A year or so ago when I first shared this card, I did a video to go with it. It’s loaded with tips for using the stamp set & punch. Oh, and did you know there is another stamp set to go with the punch? It’s in the Occasions Catalog on page 23. A little different style to the flowers and vases, so whichever you like better, you could make these cards using the design ideas! 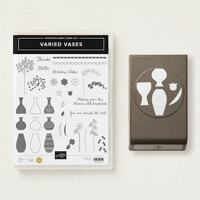 If you purchase the Varied Vases stamp set along with the punch in a bundle, you save 10%. This bundle discount is only available until the end of May! Once again, this is one of those stamp sets that I could not stop playing with! Here is another video showing the cards above and again, filled with some tips for using this stamp set and punch! If you’d like to order this stamp set or the new one, you can click on any of the little pics below to go directly to the online store. Since I have been sharing FREE tutorials with all my “throwback posts,” I guess I better this time also. About a year ago this was my featured set for my “stamps-in-the-mail,” now just called CARD KITS. 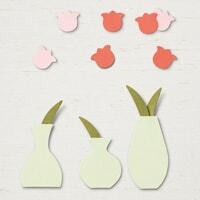 I don’t have any more card kits, but if you’d like the tutorial, CLICK HERE TO DOWNLOAD. 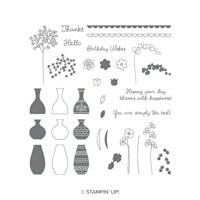 Now–go and place your order for this awesome stamp set and punch!!!! I’m glad you enjoyed these Carol! I’m not sure I understand your question but certainly try your method and see if that’s easier for you! I so enjoy all you’re videos. Being a newbie to the card making world I enjoy learning simple cards. Thank you for the time you put into teaching. Awwww, thanks Nola! I’m so glad you enjoyed these cards!